Cape plumbago (Plumbago auriculata): growing, planting, caring. An evergreen shrub with light blue to blue flowers - some cultivars are on the market with white flowers too. Full description for Plumbago not yet available. Plumbagos are shrubs with soft branches, climbing but non-twining, with evergreen foliage. From June to the first frosts they carry flowers in tubes with five petals, grouped in clusters, of blue or white color. South African plant, magnet warm atmospheres, the dentelaire will grow well in full light. Be careful however: avoid placing it directly behind a window to the south, the direct exposure could dry it. Therefore prefer the proximity of a window facing west to bathe it in brightness. Plant it in a mix of loam and potting soil in a large pot. If you are in a particularly mild climate, plant it in a rich, well-drained garden. 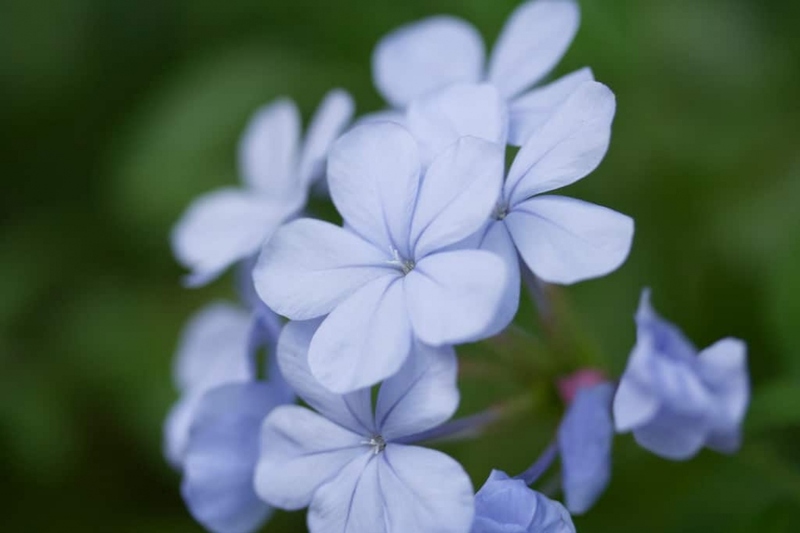 The plumbago does not like humidity in winter, so water indoors every eight to twelve days. During the growing season (spring, summer), watering should be more regular - about two to three times a week. In open soil, water only during droughts. Horticulturists advise to provide a liquid fertilizer every two weeks during the growing season, but you can also spread compost on the top of the soil from time to time. At the end of winter every 2 years, repot your plant in a slightly larger pot, adding compost, sand and dry leaves. If it is too big to be repotted, then just scrap the top and replace with a layer of compost. Every year in March/April, shorten all the secondary stems by leaving only 3-4 buds on them. If you want to limit the spread of your dentelaire, cut the main branches by a third. Put your potted plumbago in a sunny spot before summer ! Bring your plumbago in, away from frost in winter, like in a cold greenhouse. In winter, watering should be greatly reduced.